Above is a quote from an article, Guardian article: Post Work The radical idea of a world without jobs, I found particularly interesting. It was a small idea in an otherwise typical treatise on post-work/Universal Basic Income themes. Work is the master of the modern world. For most people, it is impossible to imagine society without it. It dominates and pervades everyday life – especially in Britain and the US – more completely than at any time in recent history. An obsession with employability runs through education. Even severely disabled welfare claimants are required to be work-seekers. Corporate superstars show off their epic work schedules. “Hard-working families” are idealized by politicians. Friends pitch each other business ideas. Tech companies persuade their employees that round-the-clock work is play. Gig economy companies claim that round-the-clock work is freedom. Workers commute further, strike less, retire later. Digital technology lets work invade leisure. That's a pretty good diagnosis of the current work/life landscape. But a hundred articles have been written on this topic, promoting the idea that we should work less and have more leisure time. But the idea doesn't seem to take hold? Why not? They recruited 78 people with manual, clerical and managerial jobs at local companies, and gave them electronic pagers. For a week, at frequent but random intervals, at work and at home, these employees were contacted and asked to fill in questionnaires about what they were doing and how they were feeling. The experiment found that people reported “many more positive feelings at work than in leisure”. At work, they were regularly in a state the psychologists called “flow” – “enjoying the moment” by using their knowledge and abilities to the full, while also “learning new skills and increasing self-esteem”. Away from work, “flow” rarely occurred. The employees mainly chose “to watch TV, try to sleep, [and] in general vegetate, even though they [did] not enjoy doing these things”. US workers, the psychologists concluded, had an “inability to organize [their] psychic energy in unstructured free time”. Ok, so the idea is that most people don't know how to organize their freetime to get the same flow that they get from work, that makes a certain, albeit sad, amount of sense. But still, there's article after article written about working less, when the cultural experience and data shows that even though they say they'd rather not, most people choose to work more. So that's where the little throw off side snippet at the top of this post comes in. Journaists, Academics, Creatives and Artists argue for more leisure time, but when you think about it, this is disingenuous, since what are those types of people likely to do with their new found leisure time? You got it, those types of people will do at home the same sorts of things they do at work, but instead of for someone else, they'd be employing their skills at their own direction. So is the argument, by these types of people, really an argument for more leisure time? Perhaps not, if the artist that comes home from their now shortened graphic design job to spend more time painting still lifes; or the journalist that come home earlier to now spend time writing her novel; these activities leisure and work are fairly close. Maybe the difference is not a desire for more leisure per se., maybe the actual desire is for more autonomy. More leisure time is a good way to get more autonomy. But perhaps, instead of focusing on more leisure as a means to an end: autonomy, perhaps more needs to be written about the true end goal/desire: more autonomy. but ways to have more autonomy, freedom, and not necessarily framing it as less work, might be an easier sell. Something to think on anyway. 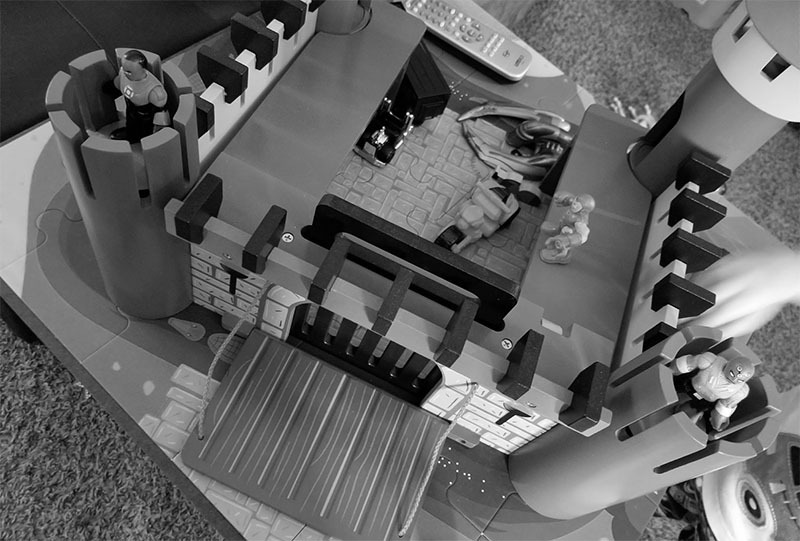 We have a Costco castle we got my son. 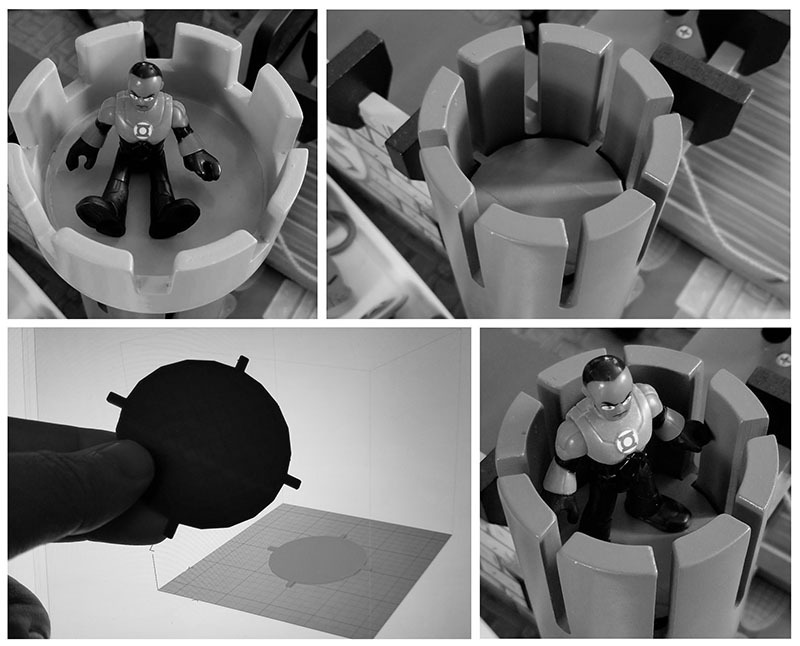 He takes the turrets off and fills the tower with small toys that get stuck. 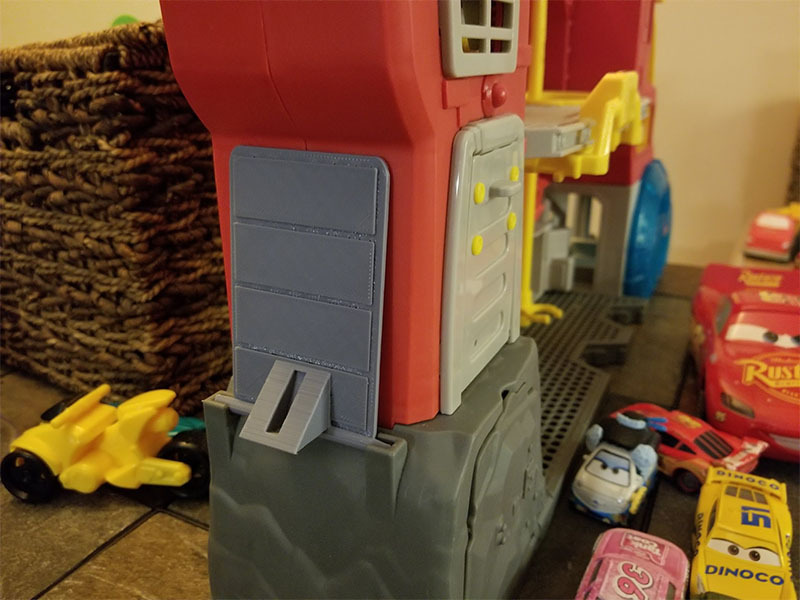 I designed, in Tinkercad, and 3d printed a simple little floor that slides into existing tower slots that blocks toys from going all the way to the bottom, but also gives him a little room at the top for his figures. Quick and fun little project. 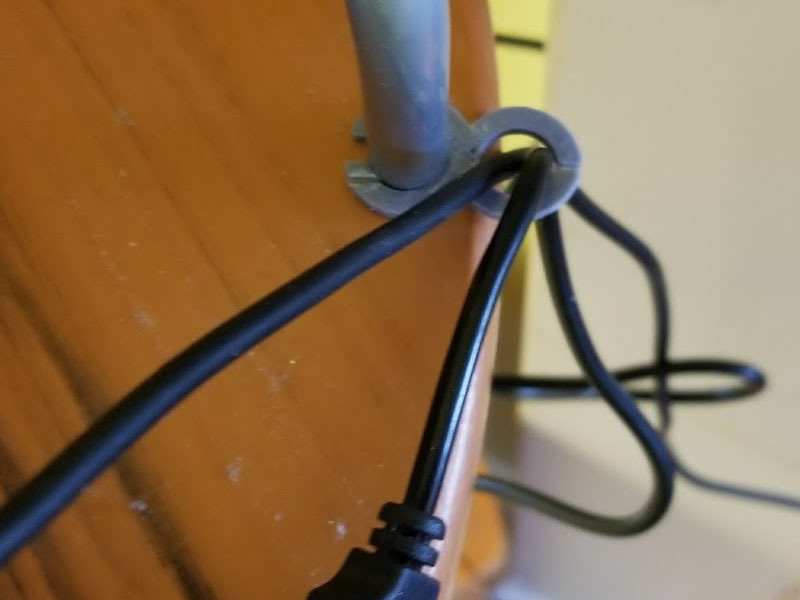 Above a cable hold I quickly designed to clip onto a poll on the back of my desk to keep a couple usb cords from falling off the table when I unconnect them from my laptop. 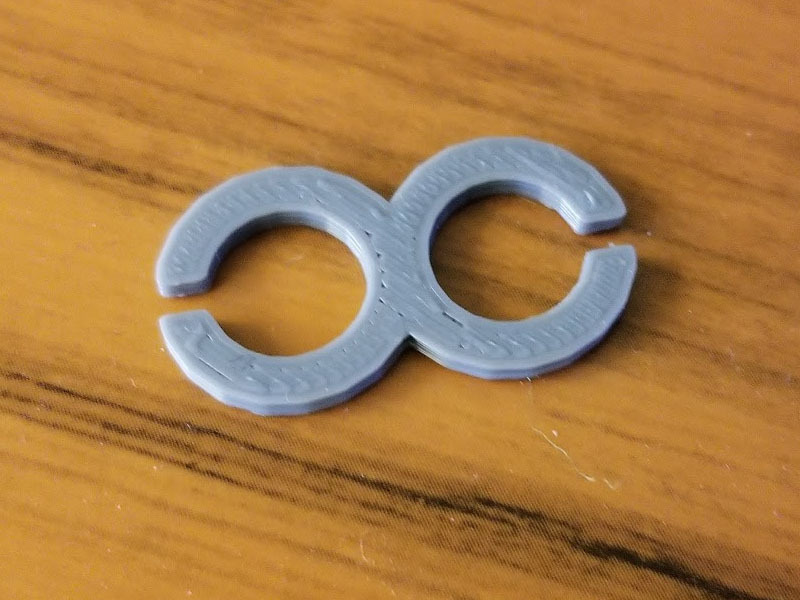 Simple little projects like this than can be designed and 3D printed in a few minutes are a lot of fun. 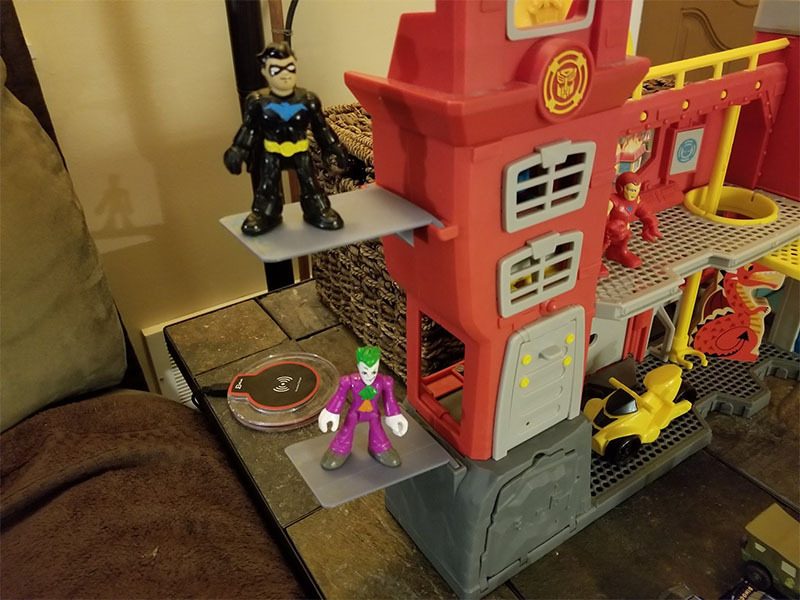 Above, some platform/doors that fit into a hinge ment for a ladder on my son&apos;s playset headquarters, another fun little thing to design and print that give him some exra places for his figures to stand on the base. 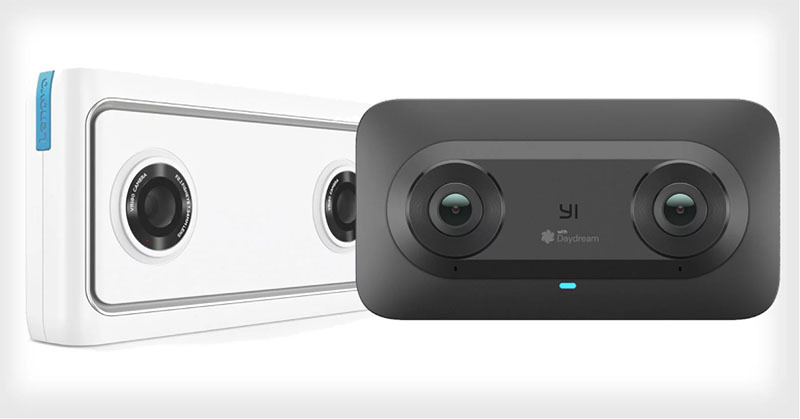 The most interesting thing to come out of CES this year, in my opinion, are these upcoming VR180 cameras, the Lenovo Mirage and the Yi Horizon VR180. These shoot stereoscopic 3D 180 degree video and are supported by Youtube and Google Photos. Available in spring 2018, I think by Summer and Fall these reasonably priced video cameras will go a long way to generating a lot more amateur and pro-amateur content that should drive more interest in VR headsets. There’s a basic psychology principle that says “Satisfied needs don’t motivate.” The idea behind it, we have a collection of needs, and those we feel lacking in, at any given moment, motivate us to action. If one is thirsty, one seeks water. If one is cold, one seeks warmth. If one is lonely, one seeks friends. If one is bored, one seeks stimulation of some kind. Unsatisfied needs motivate us to satisfy them. There’s a circle to this idea though. If one is not motivated, it can be because of something, like depression, or hopelessness, or a number of popular Twitter opined mental maladies. All of which are valid things, even if all their diagnosis, aren’t quite that. A lack of motivation, however, can also come from satisfaction too. You’re not thirsty, you’re not cold, you’re not lonely, you’re not really bored exactly either. One can be satiated to inaction. We&apos;re culturally conditioned to find this satisfaction, unless fleeting, uncomfortable. Our cultural work ethic of non-stop, abandon-all-sleep, produce-as-much-as-possible, sort of runs counter to this idea of being satisfied into a lack of motivation. To sustain that go-go-go energy, our society as deemed "the way", one must be unsatisfied, and thereby motivated to take action to satisfy oneself. Our advertising and news media work that angle, to make us unsatisfied, in order to motivate us. They identify problems, and then present, their obtainable through money or hard work, solutions. We internalize those problems and then put ourselves on motivational paths to get to those solutions. Here’s the point in the post where following format, I should point out “it doesn’t have to be that way” or there’s “a different approach”. 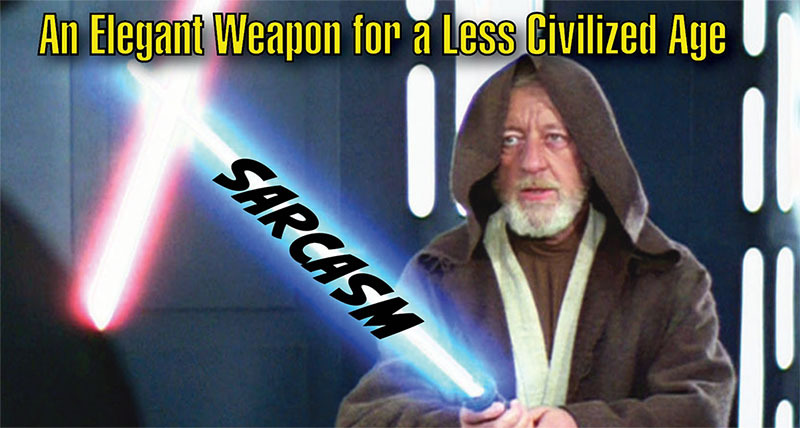 But this isn’t that sort of post. 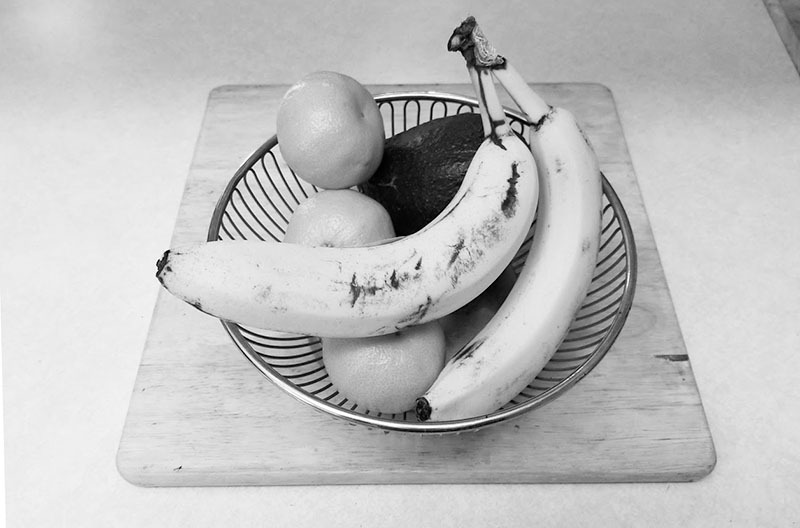 This post is much more just: look here is a bowl of fruit with an avocado in it. 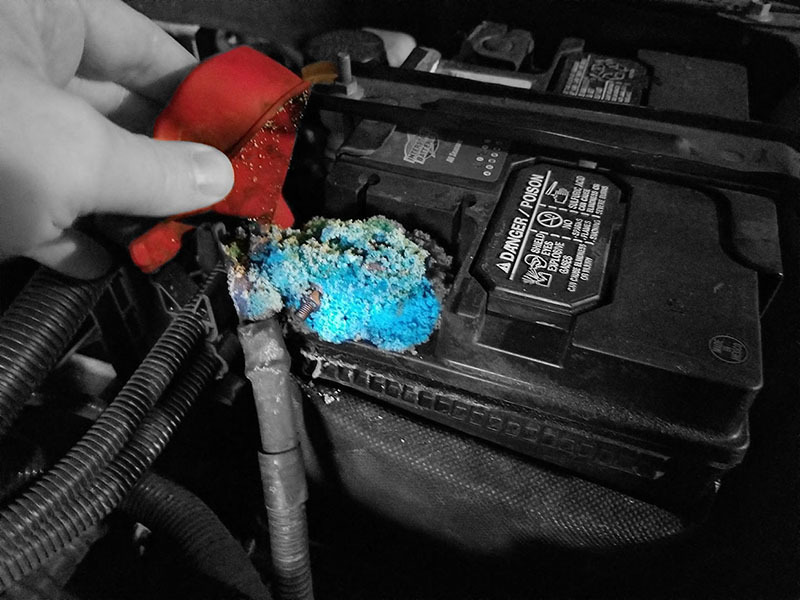 Started off the new year with a dead and disintegrating battery. Fortunately we have AAA and they came out and fixed and replaced it. Unfortunately it’s going to stay punishingly cold for the rest of the week too, with the forecast only getting up to the mid 20s starting Sunday and overnights in the single and negative digits until then. We saw the USS Callister episode of Black Mirror. Really enjoyed it. Not-Matt-Damon, Not-Christian-Slater, and Not-Sarah-Silverman were great in it. First episode we've ever watched of Black Mirror. We will go back and watch more. The above Papercraft popped up in my feed. I used to follow this guy on Twitter, I’ve bought a T-shirt from him in the past too. Talented guy. He didn’t seem like he wanted anyone he didn’t actually know ever replying back to him, even positively, on Twitter though, so I unfollowed him awhile ago. Several other people I follow, follow and retweet him occasionally on Twitter though, so I do see his stuff from time to time still. 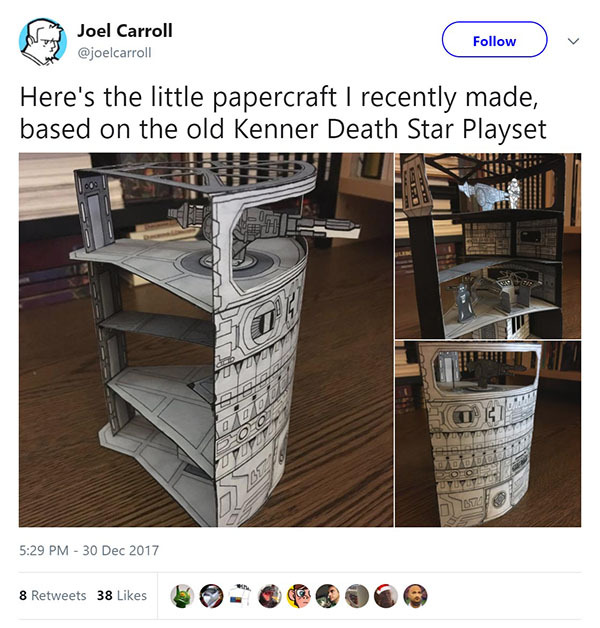 I love this papercraft Kenner Deathstar he did. I want to do some of this sortof stuff myself, for my son when he’s a little bit older.